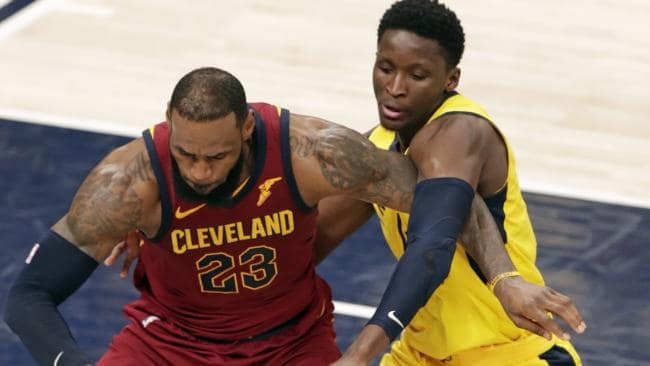 Indiana Pacers guard Victor Oladipo defends against Cleveland Cavaliers forward LeBron James. 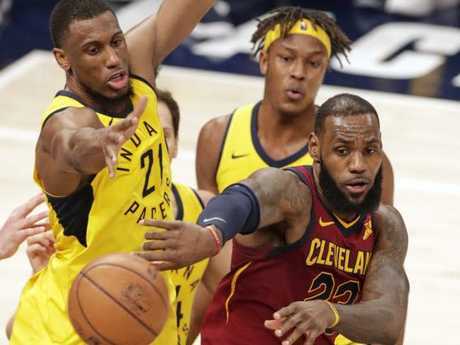 BOJAN Bogdanovic scored 30 points, leading the Indiana Pacers back from a 17-point half-time deficit to a 92-90 victory over the Cleveland Cavaliers on Friday night, local time, for a 2-1 lead in their first-round series. The incredible second-half charge came exactly one year after Indiana blew a 26-point half-time lead in a historic playoff collapse against the Cavs. This time, the Pacers delivered a devastating blow to the three-time defending Eastern Conference champs - on a night LeBron Jones joined Michael Jordan as the only players in playoff history to record 100 double-doubles. James finished with 28 points and 12 rebounds, but it wasn't enough to prevent Cleveland from losing its first game this season after leading following the third quarter. The biggest reason for the collapse: Bogdanovic. After charging back with striking distance, he completed a four-point play to finally give the Pacers an 81-77 lead with 6:10 left. He followed that with another to make it a seven-point game. The Pacers are up 2-1 in the series. James knocked down a three to cut the deficit to four, and the Cavs got another three from Kevin Love with seven 7 seconds left to make it 91-90 with seven seconds left. Darren Collison made one of two 2 free throws with five seconds left, giving Cleveland one more chance. But JR Smith's long desperation heave came up short.